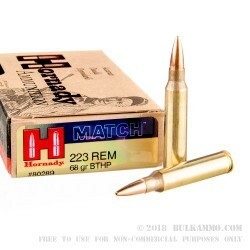 The Hornady .223 Remington MATCH Grade rounds have set the standard for accuracy and reliability among the Match Grade .223 loads. 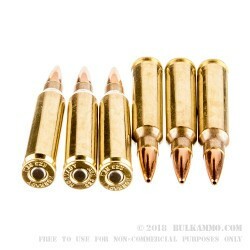 These cartridges are loaded with 68 grain Boat Tail Hollow Point or BTHP bullets that are copper jacketed and wrapped around a solid lead core. Each bullet is loaded into a new, reloadable, thick-walled, Boxer primed non-corrosive brass case. These cartridges have a muzzle energy of 1323-foot pounds, and the muzzle velocity is a screamer at 2960-feet per second. 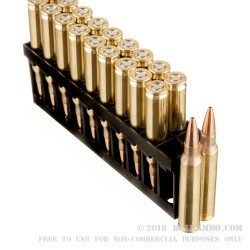 They're lightly set into small 20 round boxes that are ready for your next shooting competition, get a few boxes or get a case now and you'll be ready to try out your next firearm in .223 Remington. Get some now. 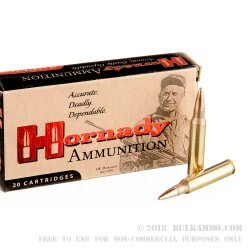 The cartridges manufactured by the Hornady Manufacturing Company have built a solid reputation in their customer base for accurate bullets, prime components, consistent quality, reasonable cost, and effective performance. The founder, Joyce Hornady created the company in 1949, and they've made quality products that have changed the ammunition world ever since. Hornady is out in Nebraska and currently owned by Steve Hornady, another family member. Today, they still make quality ammunition and reloading parts, reloading presses, and other firearms products.